I know how happy Elvis Presley was on March 5, 1960. That was the day he was discharged from active duty in the U.S. Army. I know how he felt because I couldn’t wipe the smile off my face on June 26, 1975, the day I got my military discharge. I know veterans are supposed to be proud about serving the nation, and I do feel that way sometimes. I’m sure Elvis did too, but, ya know, when you’re in the service and you don’t want to be, life can be a drag. Both Elvis and I were forced into the military by the draft. We both had careers put on hold. I’m sure at the time Elvis felt like I did, that the years in the military were wasted. It was time that could have been put to far better, and certainly more lucrative, use in civilian life. Of course, the passage of years brings a more balanced perspective on one’s military service, and the time spent there does seem to have been useful in some ways after all. For the record, here are Elvis’s significant military dates. 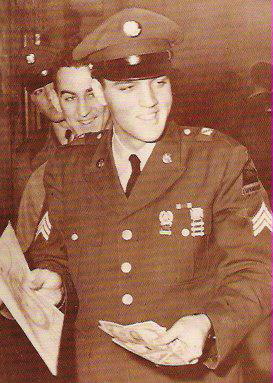 March 24, 1958: Elvis is inducted into the army in Memphis. September 22, 1958: Elvis leaves for Germany on a troop transport ship. 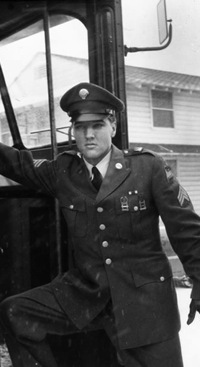 March 2, 1960: Elvis leaves Germany on a military transport plane bound for the States. March 3, 1960: Elvis arrives at McGuire Air Force Base in New Jersey and holds a press conference at Fort Dix that afternoon. March 5, 1960: Elvis is discharged 19 days short of his two-year army commitment. 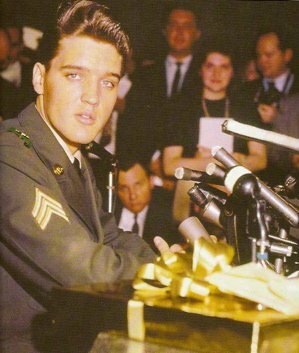 Elvis’s press conference on March 3, 1960, has been well documented. Video, audio, and print transcripts of the event have long been available, and most Elvis fans are familiar with the spectacle that day—the crush of newsreel and press cameras, the Q&A exchange, and how actress Tina Louise somehow worked her way into the spotlight with Elvis. Among the press corps present that day were representatives of both Variety and Billboard. The lengthy accounts that appeared in both entertainment publications offer some interesting sidelights to what is perhaps Elvis’s best-known press conference. “On hand to greet him were more than 100 representatives of all types of news media,” Bittan observed. “Among those present were actress Tina Louise, representing the Mutual radio network, and Nancy Sinatra, appearing on behalf of her father.” Of course, Colonel Parker was right in the middle of it all, as well, throwing out some big numbers, some no doubt exaggerated, concerning Elvis. He claimed Elvis had earned $1.6 million in record royalties while in the service. Parker announced that now that Elvis was out of the army, he would earn $850,000 from films and TV in 1960, including $125,000 for appearing on Sinatra’s May 12 TV special. As the rep for the industry’s leading music journal, Grevatt labeled most of the questions thrown at Elvis as “square.” “The matter of his marriage plans was covered at least six times,” he noted, “while that of his hair and sideburns came up at least four times.” As the meaningless, to him, questions continued, Grevatt’s attention wandered to a commotion occurring outside the room. "Boy, it will be great getting out. I will probably scream so loud they’ll make me stay two more years. I can hardly wait to start singing, traveling, making movies and above all seeing the old gang and old Graceland."